Prior to Thomas Edison's invention of the phonograph in 1877, the world had no means of recording the human voice, and the enjoyment of prerecorded music was limited to the player piano. Edison was born in Alva, Ohio in 1847. He established a laboratory in Menlo Park, which eventually employed a staff of 100. During the 7 years of its existence, he and his workers accumulated 400 patents for their inventions. One of Edison's favorite creations, and the one he was the most proud of, was the phonograph. While tinkering with one of his inventions — a device to record telegraph messages onto a paper tape — he accidentally played the tape at a high rate of speed and noticed that the sound coming from the machine sounded like spoken words. Being fascinated by the possibilities, he took a telephone receiver diaphragm and attached a needle to it. Utilizing a tinfoil cylinder as the recording medium, he placed the needle on the foil and cranked the cylinder. When he played it back, he was astonished to hear his own voice, speaking back to him from the machine. Those words were, "Mary had a little lamb..."—the first recording ever made. His fame spread worldwide. Edison established the Edison Speaking Phonograph Company in 1878 and began the construction of his recording machines, primarily for the commercial and business world. The cylinder was rotated using a clockwork-type windup mechanism. Some of the uses that he envisioned were: dictation, phonographic books for the blind, music boxes, clocks that announce the time, recording family member's voices, and as a device to record telephone conversations. Early machines retailed for around $150 ($3,000 in today's money). 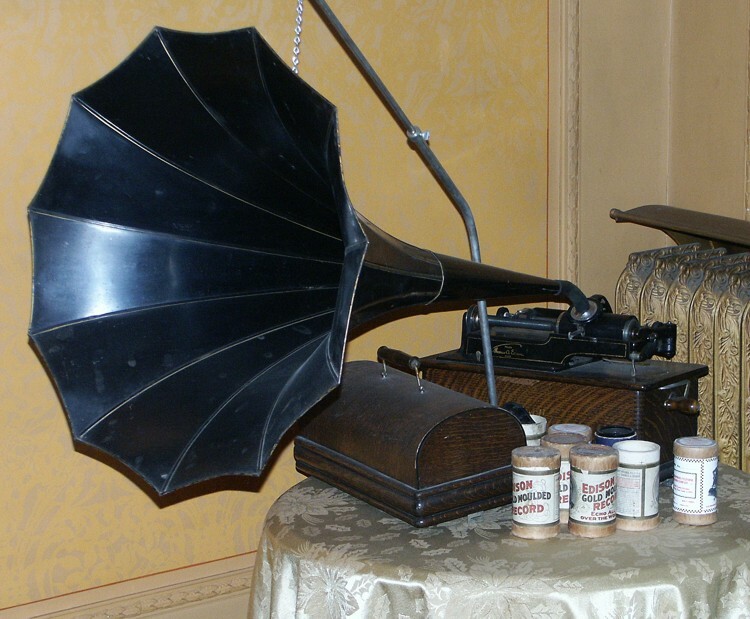 The National Phonographic Company began manufacturing phonographs for the home in 1896, and it was the first instrument to carry the Edison trademark design. Prices had come down to as low as $7.50 ($150 on today's dollars). The Edison phonograph in the collection of the Sauk County Historical Society is a model C, built around 1908 and at the time, retailed for $35 ($700 in today's dollars). The large morning glory horn amplified the sound so that everyone in the room could enjoy the music. The Society's machine has recently been made functional and now works as it did 100 years ago.